You access metrics through the Grafana UI. Grafana is the visualization tool for Prometheus. This starts a local proxy of Grafana on port 3000. For security reasons, the Grafana UI is exposed only within the cluster. Set up an administrator account to modify or add dashboards by signing in with username: admin and password: admin. Before you expose the Grafana UI outside the cluster, make sure to change the password. You will be prompted to set a password on first login, and it can later be changed at http://localhost:3000/org/users. Although Grafana provides a richer set of graphing functionality, Prometheus can still be useful for debugging. This starts a local proxy of Prometheus on port 9090. For security reasons, the Prometheus UI is exposed only within the cluster. 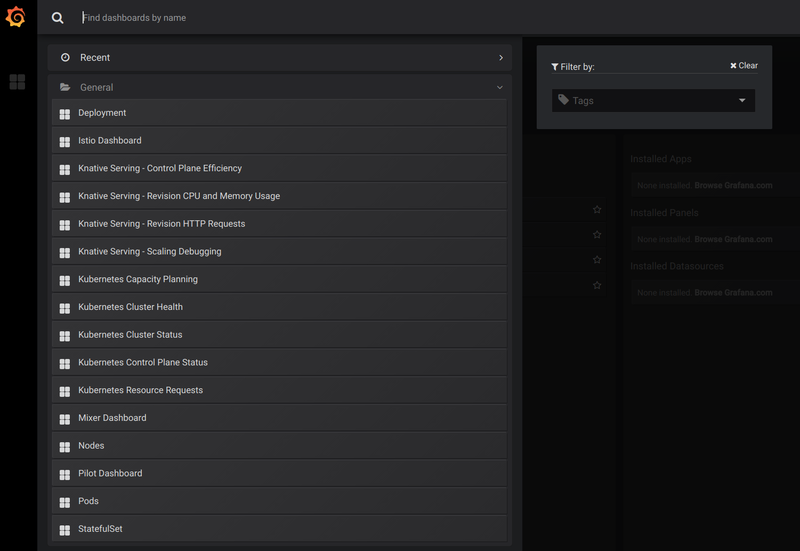 You can use the Prometheus web UI to troubleshoot publishing and service discovery issues for metrics.